Download four free sessions of the Fall 2017 Explore the Bible: Daily Discipleship Guide. Just enter your email address below. Context is the key to knowing the difference between what the Bible actually says and what we want it to say. Explore the Bible can help your adults, students, and kids understand and experience Scripture like never before. 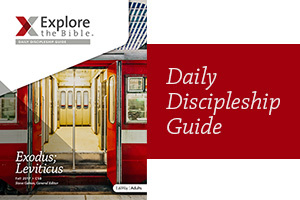 By signing up, you agree to receive information regarding Explore the Bible: Daily Discipleship Guide and other LifeWay resources.